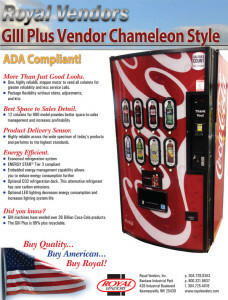 Coca-Cola – GIII Plus Vendor Chameleon Style — Royal Vendors, Inc. Optional CO2 refrigeration deck. This alternative refrigerant has zero carbon emissions. GIII machines have vended over 36 Billion Coca-Cola products. The GIII Plus is 99% plus recyclable.